Last summer, Twitter launched a new experience for Windows 10. It included live tiles, multiple photo tweets, animated GIFs, Vine playback, previews for tweets with photos, vine videos, and other content in the home timeline, and the ability to share photos privately in direct messages. All of this was new at the time, but it was only for PCs and tablets. 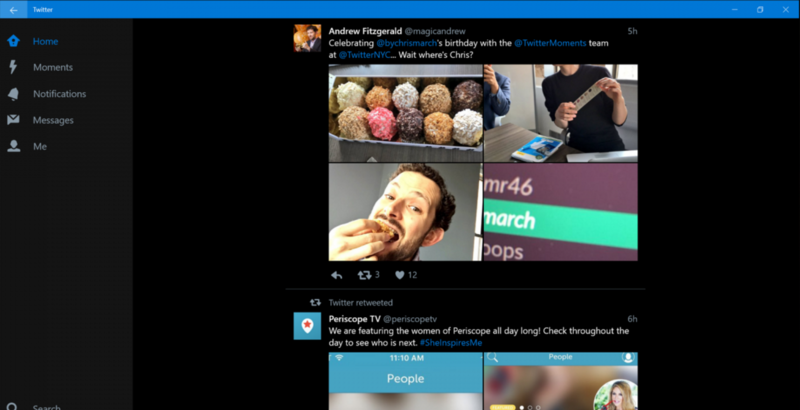 Now, Twitter is making Twitter for Windows 10 available for mobile. In Twitter for Windows 10 Mobile, we’ve added features that make content discovery, as well as both public and private sharing, more seamless than ever. Explore Moments; send group Direct Messages; shoot, edit and Tweet video; share a Tweet and easily add your own commentary with quote Tweet; and check out top Tweets without logging in. Also, on Windows 10 on desktop and tablets we’ve added one of the most requested features: the dark theme. Change your theme by going to Settings > Personalization. The updated app is available in the Windows Store.